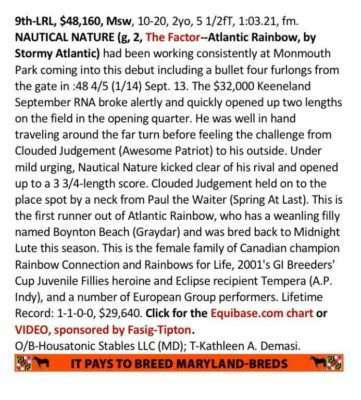 Nautical Nature is a Maryland-bred son of The Factor, a multiple Grade 1 winner and track record-setting son of leading sire War Front, and he is the first foal from his dam, Atlantic Rainbow, whose second and third dams were both Broodmares of the Year. 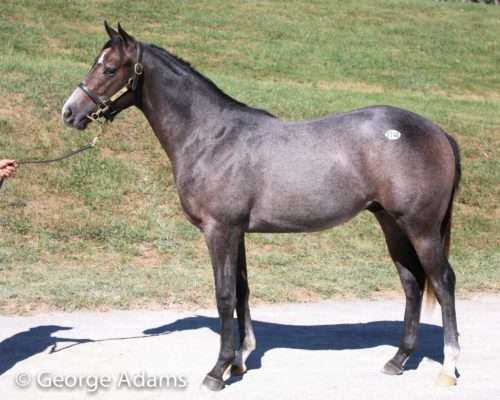 He was bred by Housatonic Stables LLC, and raised at Shawhan Place in Paris, KY.
We now co-own Nautical Nature with Derek Brown, and with Greg & Kate Demasi’s Pewter Stable. 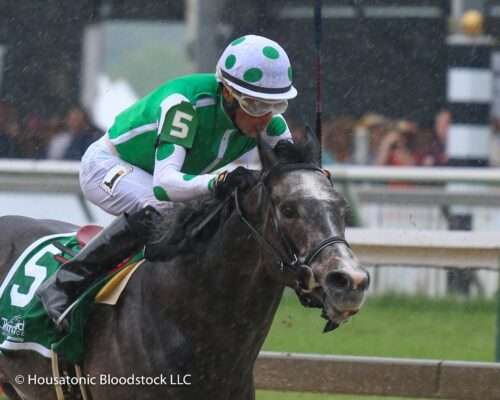 Nautical Nature is trained by Kate Demasi, a 2016 inductee into the Parx Hall of Fame, after receiving his early racetrack lessons at Woodberry Payne‘s Ingleside Training Center, located on the grounds of James Madison’s Montpelier. Nautical Nature made his racetrack debut on October 20, 2017, at Laurel Park, where he went wire-to-wire impressively in a $40,000 maiden special weight! 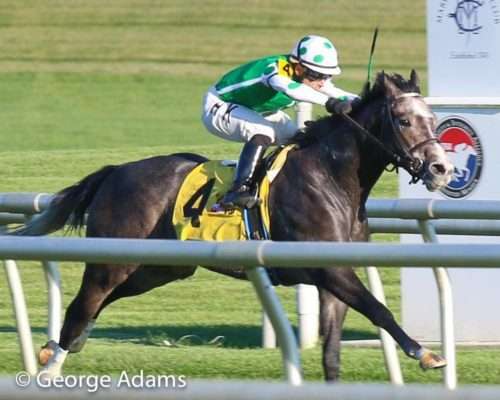 He was a hard-trying 4th in his first try against winners, and first try on dirt, in an allowance race that came off the turf a month later in his juvenile finale. After a winter break on the farm, Nautical Nature made his 3-year-old debut in the slop at Pimlico on Black-Eyed Susan Day, finishing a close 3rd. After a bit of a flop at Laurel in June, he bounced back with a strong 2nd place finish against tough older sprinters on the Monmouth turf in July, and was 2nd again in the slop at Monmouth in August. Nautical Nature again took this past winter off at the farm, and is now back at Parx with trainer Kate Demasi, targeting the Mid-Atlantic turf season in another month. You can check out more photos of Nautical Nature here. Nautical Nature wins his debut in a Laurel maiden special weight!